I tend to not make Arroz Verde Mexican Green Rice too often, and probably not as much as my other Mexican rice dishes because it is a little more work and calls for a few fresh ingredients I don’t always have right on hand. But for a special occasion or a special Mexican meal, nothing can beat Arroz Verde Mexican Green Rice. If you’re not familiar with Arroz Verde Mexican Green Rice (sometimes called Arroz Poblano), it’s a marvelous side dish and goes particularly well, I think, with any dishes that have a Green Chile or a Green Chile Tomatillo Sauce. (You’ll find a few of those on my post: Mexican Recipes for Cinco de Mayo or Anytime.) And that makes sense because, well, it’s green! It’s probably even a little greener than it looks in my photos. I’m still trying to figure out how to take good food photos. I’m a cook, not a photographer! It’s just a constant struggle for me, so you’ll have to trust me that this rice IS really pretty green! Arroz Verde Mexican Green Rice has a little bite to it that’s just super delish, but not much of one. There’s just one jalapeno and the Poblanos are pretty mild. Part of what makes Arroz Verde Mexican Green Rice so delish is that the rice is cooked right in a sauce that’s a blend of the peppers and herbs and spices, so every single grain of rice carries all those flavors! If you’re worried about the heat, leave out the jalapeno or just put a slit or two in your jalapeno and add it to the rice. When the rice is done, the jalapeno can be retrieved and served to whoever is the heat lover in your family, just like the jalapeno in my recipe for Restaurant Style Mexican Rice. For me, the one jalapeno is just perfect. 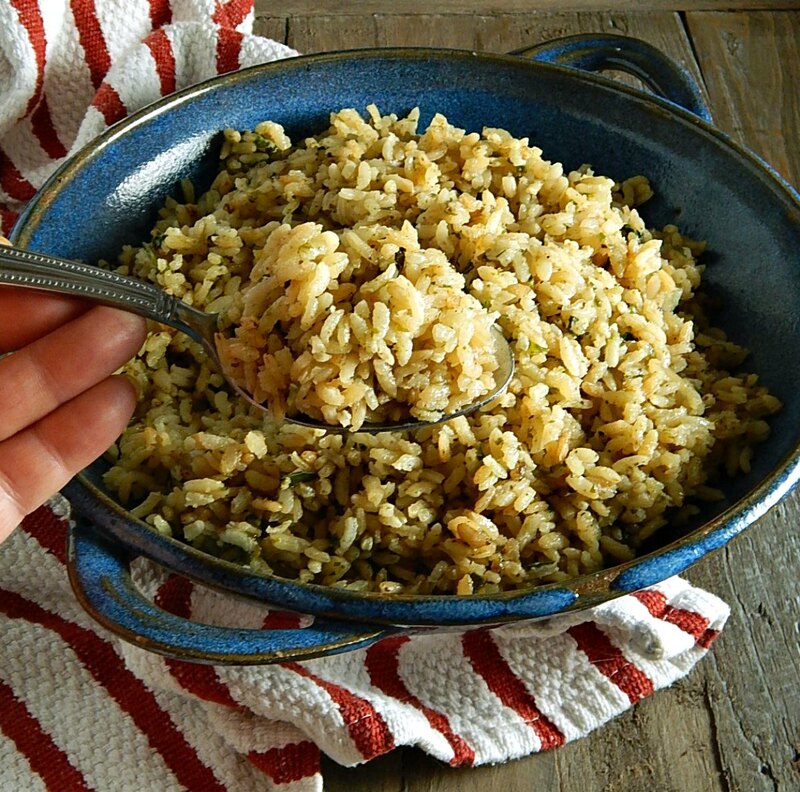 The biggest thing to know about Arroz Verde Mexican Green Rice is that it’s easy to make a bad one! With all the flavorings like the poblano peppers and the jalapenos all mixed up and incorporated into the rice as it cooks, it could be very easy to make a mushy rice. Yah, I’m raising my hand, here. I’ve done it! And the way to make the rice mushy is to not go through a good saute process at the beginning or to be rough with it when it’s done. Add the rice to the skillet and be patient as you saute it until it’s a light golden brown all over. Stir frequently and have your other ingredients ready to add as soon as the rice is toasty and golden. It’s a fine line from toasty and golden to burnt, so once that rice is just perfect, quickly add your other ingredients in. That will cool the pan so the rice doesn’t scorch. You’ll want to be very gentle when the rice is finished, too. When you take the rice off the heat, open the lid and give the rice just a few gentle nudges so the steam can escape. Leave the lid off and let the rice sit for about five minutes, then fluff with a fork. That’s a little different than most rice recipes, but trust me, it will give you the perfect Arroz Verde Mexican Green Rice. Arroz Verde Mexican Green Rice is really a great special occasion or company dish, although once you have it, you may want it all the time! I’ve told you pretty much everything you need to know about shopping for rice on my post for Perfect Instant Pot Rice so I won’t repeat it all, here. In my area, peppers like jalapenos and poblanos don’t go on sale, ever. The per pound price is downright scary, too. The good thing to know is that the peppers don’t weigh a lot so the total output of cash isn’t so scary. In a pinch, use a can or two of diced green chiles. They run about a buck or so and do go on sale. I stock up on them whenever I see them at a low and particularly watch for sales around Cinco de Mayo. You are going to want a good, strongly flavored chicken broth in Arroz Verde Mexican Green Rice, so Homemade Stock is the way to go if at all possible. If you don’t keep homemade in the freezer, think about using a powdered chicken broth base rather than a boxed one, and make it just a little stronger than you normally do. Add one cup of broth, poblanos, jalapeno, and cilantro to food processor or blender. Process till nearly homogeneous. Some rougher pieces are just fine. In a saucepan, add oil and heat over medium-high heat. Add rice and onion. Cook, stirring often until rice is golden brown. Add the blender mixture and remaining two cups broth, salt, and pepper. Stir, just one time only around the pan. Bring to a boil, cover, turn down to a bare simmer and cook rice 14 minutes. Remove from heat and using the most gentle of motions, lightly fluff the rice, not completely, but enough so some of the steam can escape. Let rice sit several minutes, then finish the fluffing. Serve immediately. Arrange peppers in a row on a foil lined cookie sheet, just touching each other. Add the jalapeno, if using. Place about 4 inches under the broiler. Broil until blistered, two to three minutes, then remove the sheet pan from oven and turn the peppers, broiling again until blistered. Repeat until all sides are blistered and slightly charred. The jalapeno may take longer; being smaller, it’s further from the heat. It can finish on it’s own and be added to the poblanos to steam when it’s done. Place peppers in a small paper bag or a small bowl, sealed with plastic wrap and let sit for about 10 minutes to steam. When cool enough to handle, remove the majority of the charred skin, open and remove stems and seeds. Roasted peppers freeze well and a great shortcut is to make more than needed, then divide into small portions and freeze. This entry was posted in Click here for Fabulous Food Posts and tagged Chicken Stock, hearty sides, Hot Peppers, Jalapeno, Mexican or Southwestern, Poblano Peppers, Rice, Side. Bookmark the permalink. I see onion listed twice. When do I add it the second time? Making this for a Football playoff game on Sunday. Theresa, I’m so sorry I put onion down twice! I am fixing it now! This is a great potluck dish!! All fixed, now! Thanks so much for ;pointing out the duplicate listing for the onion! I appreciate it. Perfect for my next Taco Tuesday! Or Taco Friday, or Taco Sunday or Taco Monday… you get the idea. lol!! Thanks Jaxx! It’s truly delish! I was exactly thinking of trying this rice today. Thanks for sharing the recipe. Happy Fiesta Friday! My pleasure and thanks for hosting for us! Ah, I love Mexican food 🙂 This looks great. Thanks! I am just about craving this rice now! The food I miss the most living here is Mexican (yep, no Mexican joints) and you go and post those incredible images of that Mexican Green Rice. Now, I’m really craving Mexican food. I’ll be making this to go with the fajita feed we have planned for the weekend. Fajita Feed! That sounds wonderful!! I felt the same way when I moved from Colorado to Minnesota years ago. There were a few Mexican restaurants and I went to every one and they were all horrible! Now, though, we have lots of choices. Minnesota was not known for being heat lovers back then, but now a lot has changed. I remember a friend that just about died from a little packet of taco bell’s regular sauce, for instance! That was when I decided if I wanted Mexican food, I needed to learn to cook my own! This looks really tasty. I’ll have to give it a try. It’s really a fun dish and so delicious! Damn it Jim, I’m a cook, not a photographer! Bahahahahahahahaha! Sorry, but it had to. Also, your rice looks DELISH! I’m still doing the low carb thing so anytime I see rice or pasta, I lose my mind a little bit. Lol! I love that line! Grew up watching the original Star Trek after school!! I don’t know why on earth it’s not green, lol!! As far as your mind, if you lose it, I’ll let you know if I find it, , Bhahhahaha!! I’m posting Cauliflower Mash soon, that should make you happy!! Hi thanks! It’s amazing what a little poblano can do!